Please allow me to introduce you to a number of my favourite walks. WHATEVER THE SEASON! I find myself in moods that vary from deep positive introspection sitting on the rock below the cliffs at Rhoscolyn, to glorious euphoria of walking through Newborough Forest to Llanddwyn Island. That view or moment of personal epiphany that just leaves you breathless and temporarily removed from whatever burdens you are carrying for yourself or others. The walks I'm going to present to you - little by little - are very personal choices, which I hope you will discover as starting points for your own journeys of discovery. Last year’s Summer was all to brief and - because I was so busy with other things - it was gone before I really got a good hold of it. So what do I do now that we have turned season and lost a valuable hour of light? I need light and, despite calls to reduce our Carbon Footprint, I admit freely that I keep the lights on. There is a part of me that instinctively knows that I fade without daylight and the space which that creates about me. The shadows diminish and I begin to feel okay again. The More Sunshine, the Better. Don’t think for a moment that I’m a depressive. Far from it. My body knows what my soul needs and I accept it. I choose (or is it struggle) to take almost everything in moderation except Daylight, the Beauty of Anglesey and Excellent Company. SO, HOW DO I SURVIVE THROUGH THE WINTER? I walk as often as opportunity allows and I embrace the seasonal changes. Winter reminds me of the Spring that is to come and Summer reminds me of the reflection that Autumn brings. Reflection on all that has passed during another busy year. What can I to do to slow down Time's passage? The busier I am the richer is my life, but time rushes past. The more idle I am, then the days are intolerably long and empty. Rich, tasty stews and casseroles and golden flickering coal fires casting shadows that enthrall. Doing silly things with friends and planning Winter beach picnics. 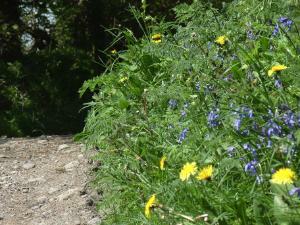 Although Anglesey is a small island I am constantly discovering new paths and different perspectives on the familiar. I like to know the names of places and of the views that I can see if I was looking at where I am now from way over there. 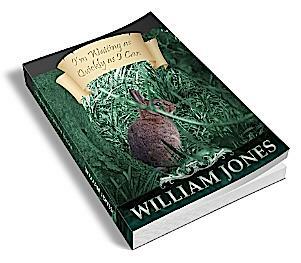 The wonderful news is that journeying to Cors Bodeilio will lead you into a rural idyll as you want it to be. 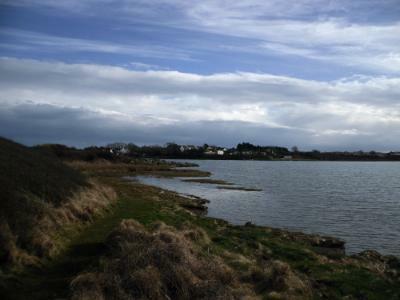 The Island of Anglesey presents an abundance of opportunities to enjoy yourself in one Area of Outstanding Natural Beauty after another, after another. Anywhere in the world where bunnies are allowed to sunbathe and graze peacefully in pleasant rumination on gentle pastures is also Heaven for me. I don’t know why. It just is. That’s one of the reasons I love Rhoscolyn. 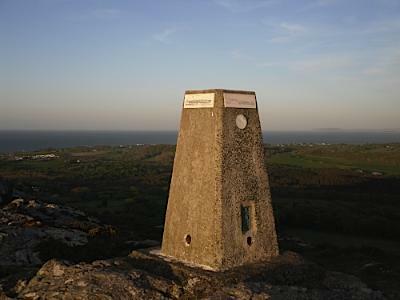 I wish for you to know about Bodafon Mountain and to visit while you’re here on Anglesey. Respectfully, I recommend an Anglesey evening when the sky is big and blue with the pink sunset beginning to invade its western edges. Do you care for the wind susurrating through tall Corsican pines and soaring, croaking ravens as the soundtrack to a long peaceful walk to clear your head? 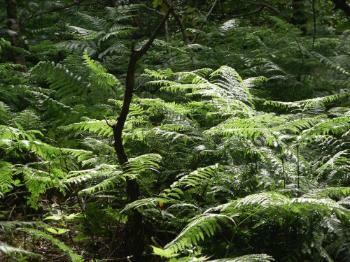 One of the largest publicly accessible forests in Wales. Views through the trees of the beautiful Cefni Estuary and beyond and a chance to see the lovely critters that are Anglesey’s main Red Squirrel population. Unless you’re enjoying the Anglesey Coastal Path from Menai Bridge or arriving from the other way from Brynsiencyn, then this is a portion of a very pleasant walk along the Menai Straits. You can spend five or ten minutes Below the Britannia Bridge and at Pwllfanogl or, like me, stand and stare for quite a while. I also listen a great deal. With my eyes shut it is another landscape to view and appreciate. 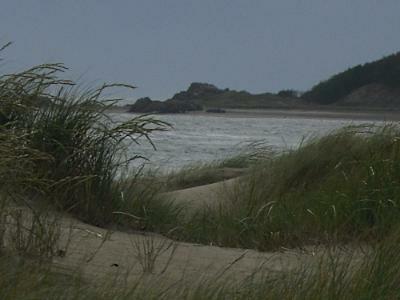 Llanddwyn has two gloriously long beaches and as I write elsewhere, are “Longer than Childhood Summers’. The wonderful thing about these two beaches, separated by Llanddwyn Island is that they can offer you as much privacy as you wish. Getting here can be a joyful brief walk of about 20 to 25 minutes skirting the massive Newborough Forest and gazing out over Newborough Warren. The Warren is one of the largest sand dune areas in Britain full of horses and bunnies, hence the title. Absolutely lovely walk with a beautiful beach to arrive at. Have a nice walk and beach day. 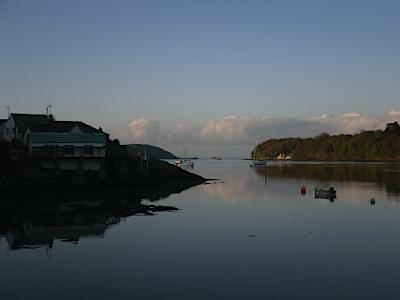 As Menai Bridge gently falls under the spell of a golden sunset the pale blue sky casts a reassuring and gentle air over all that you perceive. The walk along the Menai Straits toward the Britannia Bridge and Ynys Gorad Goch is a gentle preparation for a meal in town or to gather pleasant images to carry you into the embrace of Lethe and thence to sweet slumber. Mynydd Llwydiarth forest on Anglesey may not have Wolves or Bad Bears but it does have Red Squirrels. Even Better for me, it’s a brilliant woodland walk and so peaceful. Take the time, bring a picnic and get over there. Anglesey's Coastal Path is a glorious piece of geography to explore. It's never bland and it's never dull. Walking along the north coast of the Island will reveal not only nature at its most tranquil but also at its most ferocious. There are fabulous discoveries that reveal themselves to you suddenly, unexpectedly. The brickworks is a place where you can indulge yourself in some Industrial Archaeology. And Poke Your Nose Around. 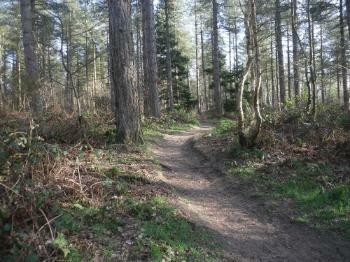 I heartily recommend you to enjoy this hour long walk to build up a healthy appetite or to aid digestion. Ynys Leurad is a small island in the tidal strait between Anglesey and Holy Island (Holyhead). 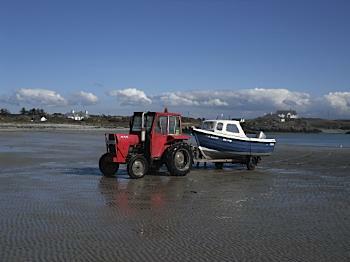 Enjoy a pleasant - if not occasionally muddy - little pootle from Fourmile Bridge in the Valley/Trearddur Bay area. Find the Prehistoric Irish Huts - Good Luck on that one and hopefully No Dead Bodies. P.S. Have You Lost Your Tent? 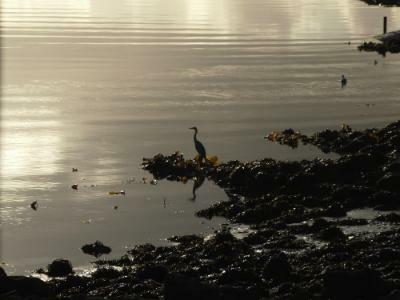 Maybe you're a fisherman or fisherwoman who's heard about the fishing at Ty Croes? There again, maybe you're just wondering where you can enjoy a pleasant little walk in the Rhosneigr area. The Anglesey Coastline all the way from Rhosneigr to Ty Croes and thence to Aberffraw is a gentle amble that'll take the time it takes. A lovely place to enjoy the Sun set dramatically over the sea. 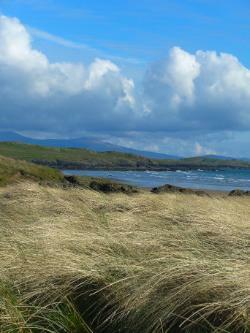 Face the other way and walk toward the mountains of Snowdonia and Llanddwyn Island in the middle distance. In Summer you feel as if you are standing on a promontory set out into the sea. The sense of blueness is astounding. In Winter, it feels as if the wind could strip your flesh to the bone with its bitter cold. Ideal for a post-Christmas Lunch walk. Enjoy the panorama of the whole of the east coast of Anglesey, the Great Orme in the distance and Snowdonia to your right. Choose your season to choose your challenge. • Puffin Island – Ynys Seiriol, Priestholme. Home of the Pickled Puffin and the Pickled Oyster. 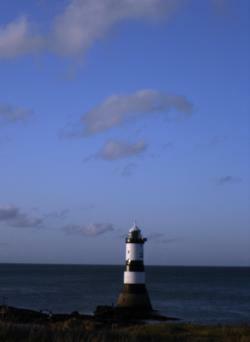 • Penmon Lighthouse – also known as the Menai Lighthouse. • The Priory – St Seiriol’s sixth century priory and hospice. • An absolutely fabulous place for a picnic and to gaze wistfully or contentedly into the near distance. Coastal walks are such personal affairs and dependent on the mood you bring with you. When encumbered by life’s pressures I seek to arrive at the coast in wild, windy weather. Aberffraw seems to suit the mood and the distraction of waves breaking wildly and the wind in my face seems to release me. The images that I share with you here were taken in June of this year, when I just knew I had to walk. In solitude. The sky was big and blue, the Sun shining bright and warm with a gentle refreshing breeze acting as pleasant physical external stimulation. Llangefni is the administrative centre of Anglesey and is a valley that follows both the River Clai and River Cefni. The River Cefni strikes on the Clai near the centre of the town after falling down through the obvious woodland called by locals as Y Dingl or The Dingle. 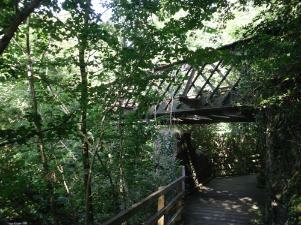 Now, it's the fabulous Dingle Nature Reserve woodland boardwalk path that I'd like you to discover. 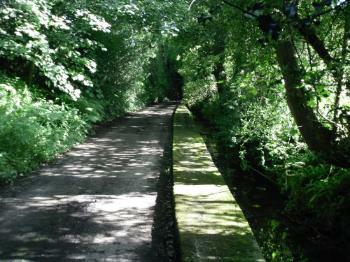 This is a gentle walk of about a mile and a half that is ideal for fit or infirm, pushchair and wheelchair users. Especially ideal for those who would like to take a breather. The boardwalk will take you well away from the bustling town and into wonderfully gentle and interesting woodland full of sounds and sights guaranteed to delight, whatever the season. When I visit beaches, walk the beautiful coastline of Anglesey or just rest in quiet contemplation in some ancient churchyard, my thoughts gather to reflect on what's gone right and what's gone wrong. Then I write about it. I used to do a bit of psycholog-ing. The lesson is to just SIT, REST & REFLECT. To learn what I mean PLEASE CLICK HERE or click on the Sweet Bunny Image above. 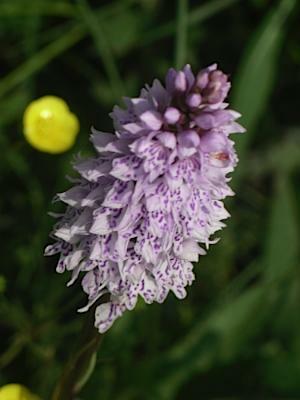 Over the next few weeks I'l be offering you a number of other casual walks for your consideration. For instance, have you heard about Anglesey's recently re-discovered Hidden Gem at Aberlleiniog Castle in Llangoed? Again, in the midst of all the appalling furore that surrounds Anglesey County Council, sometimes they get it bang on right. And they have here Congratulations where congratulations are rightly due. Aberlleiniog Castle is a recent rediscovery of something that all the locals knew about, but was fading away by neglect and according to the Second Law of Thermodynamics (Entropy). Entropy - what happens when we lay out all our wares for moth and rust to corrupt. This is a lovely walk past a pair of very curious lamas through a well-designed and well-maintained little riverside path. No more than a few miles in its complete circuit. I've got some nice pictures that I look forward to sharing with you. Then there's Llys Dulas and a lovely Evening Walk to Dulas Beach. 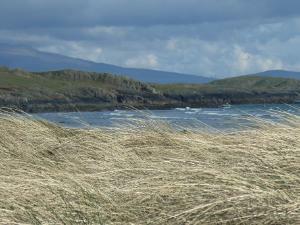 And again a gentle bright evening's amble to Ty Croes to Aberffraw. So much inspiration. 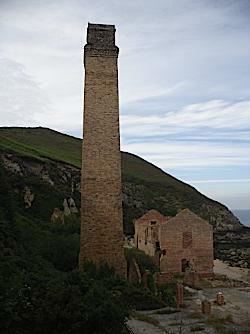 Love Anglesey and we drive over from Llandudno often to discover more hidden delights and gems. Thank you. 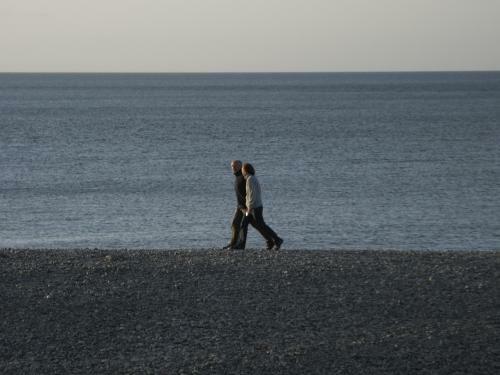 My friend Judd's got a nice page on his site LIFE'S SECRETS about the health benefits of walking. 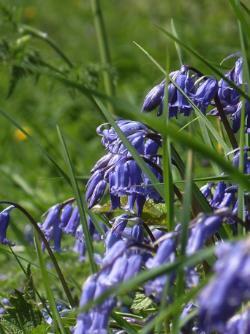 Return from Anglesey Walks to HOME PAGE.